Jazz on the Vine and Valentine’s Day pair up at the Peconic Bay Winery on February 14th. This is sure to be a special Valentine’s Day with a special visit to Peconic Bay Winery. From 1-3 P.M. saxophonist and composer Sarah Manning will be perform with Shatter & the Glass Quartet. Originally from New England, Sarah Manning is now back on the East Coast and sounding better than ever, with her own unique voice. The performance will then be followed by a special Valentine’s Day Wine and Cheese Pairing from 4-6 P.M. which will feature a variety of fine local cheeses from The Village Cheese Shop and of course, locally grown wine from Peconic Bay Winery. 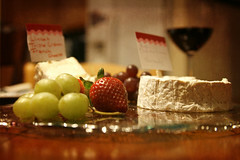 The Valentine’s Wine and Cheese Pairing will feature a variety of five cheeses, each paired with two different wines. Thus, showing the diversity of the wines and how different wines can be paired with a specific cheese. Of course, the Valentine’s Day Wine and Cheese Pairing would not be complete with a chocolate surprise! While the jazz performance will be free of charge, the Wine and Cheese Pairing is $29.00 person and reservations are required. This is a very popular event and call 761-734-7361 for reservations.